Maybe not exactly, but this is the future. French "voice sculptor" Gilles Azzaro created this work as an exemplary manifestation of what 3D printing can do, and you should be amazed. The digital artist (and drummer!) mapped out a portion of President Obama's 2013 State of the Union Speech - the section in which he espouses the importance of developing this technology - to a three-dimensional waveform-scuplture. 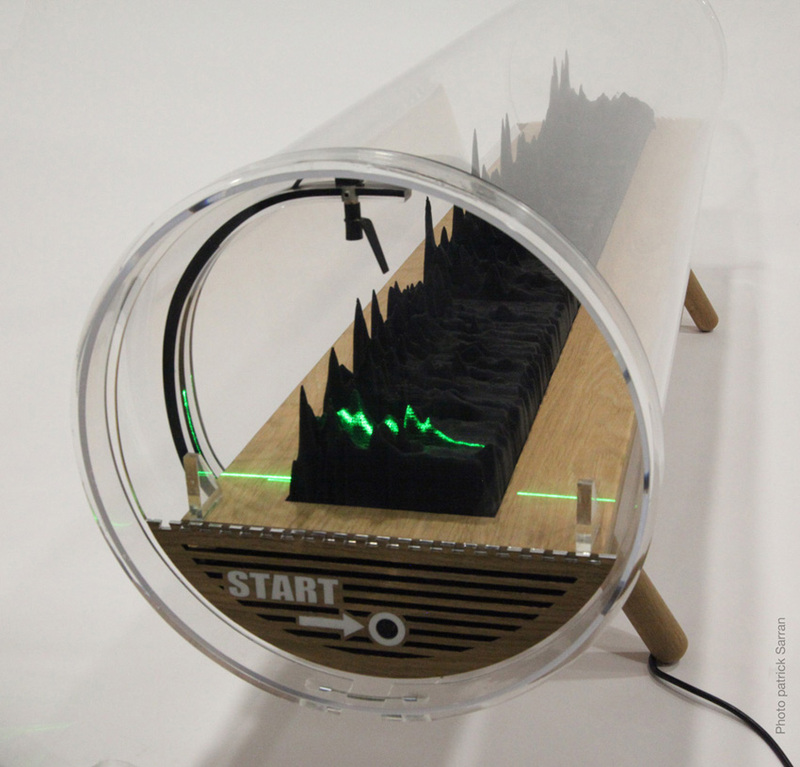 As if the sculpture itself wasn't cool enough, he then makes playback possible by reading the peaks and valleys with a laser. A green one. Monsieur Azzaro got his start in the electronic sound world as musician and MIDI programmer - his work helped to create the first drum machines in his younger days. Naturally, a project of this magnitude could only come from the mind of a drummer. I'm serious about music playback possibilities with this technology. Azzaro has already got a system very similar to how a phonograph operates: he's traded a stationary needle reading minute grooves on a spinning surface with a laser reading (seemingly) scalable, three-dimensional peaks and valleys. This could be the successor to the wind-up music box, in HD. Thanks to a design by Patrick Sarran that uses a desktop 3D printer, we're now free to imagine a world where we can send Logic Pro masters to a CAD program and get one of these. The implications for education and research are pretty heavy, too. Need to look closely at the waveform of a recorded sound? Just use magic, er, computers to create some audio stalagmites in just over a day. Click the title link to read more. Reblogged from The Creators Project via Gizmodo.